When my daughter Josephine was a preschooler, she complained, "I wanted to play with her, but when I asked to play, she said, No." This wasn't a once or twice complaint, but one she voiced almost daily, and more often than not she was being rejected by her best friends. When I asked her teacher (and my mentor) Chris David about it, she replied, "If you want to play with a preschooler, sometimes the worst question to ask is, Can I play with you? The answer is almost always No." And while I've found this characterization to be a bit of an exaggeration, it is true for most kids some of the time and some kids most of the time. These are years during which children experiment with power and there are few things more powerful than telling someone No. Instead of asking to play, Chris suggested to "just start playing." If it's dollies, then pick up a doll and start playing too. If it's blocks, start building. If it's painting, then paint. And before long you're not just playing beside someone, you're playing with them. 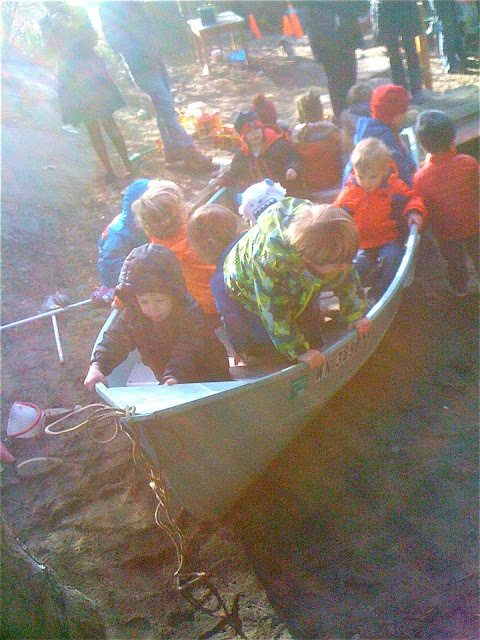 Yesterday, I wrote about a couple of the ways I help children enter into play with one another, which can be a very challenging proposition at any age. Some kids are naturals at it, and if you take the time to observe you'll find that most of these master players do it just the way Chris suggested I coach Josephine. Perhaps they take a moment to survey the scene, but typically it isn't very long before they've dropped to their knees and gotten busy. They don't try to change the game in progress, they don't try to get their hands on a toy that's already in use, and they definitely don't ask for permission. When I suggested this approach to Josephine, however, she answered, "But I have to say something!" I've since found this to be true of a lot of children. It might just be temperament or it could be that they've internalized some adult social conventions, but whatever the case, there are some kids who seem constitutionally incapable of simply dropping into the midst of things. They feel the need to announce themselves or their intentions or to otherwise make themselves heard as they enter into play. So we strategized what kinds of things she could say that didn't present a yes or no option. "My dolly is your dolly's best friend." Or the line I use to this day when role modeling how to enter into play, the straight-forward assertion of fact, "I'm playing too." Yesterday, I gave examples of how I role modeled inclusive behavior, ways to both enter into play and accept those seeking to enter into play. Now, I don't expect every game to be open to all comers, sometimes you have something going with your buddy and there isn't room for one more, but we strive, as a general rule, to create a culture of inclusion in our classroom. It starts with the adults, of course, and since in our cooperative classrooms somewhere between one-third to one-quarter of the bodies in the room belong to grown-ups, that gives us a running start. As adults, we almost always respond positively to attempts to enter into play with us. After all, that's why we're there, and when we can't, we explain why (e.g., "I'm helping Billy with this puzzle right now"), then let them know when we will be able to accept the invitation (e.g., "I'll play with you as soon as I'm done"), then we follow through. I tell the adults that it's their job to role model inclusive behavior, to always seek to find a way to add one more child to whatever it is they're doing. If it's a puzzle, invite a second or third child to help. If it's a board game, go ahead and stretch and bend the rules to accommodate one more. If it's playing princesses in a castle, find another throne, make another crown, or suggest another gown. When a child complains to me, "They're not letting me play," my stock response is to reply, "I'll play with you, come on." We then head right over to the kids who have somehow given the impression they don't want to play, sit down beside them, and say, "We're playing too." I don't want to boss or guilt anyone into playing with anyone else, but if I'm going to understand the dynamic of this particular exclusion, I figure I need to get right in the middle of the play, rather than the middle of a fight about play. Most of the time, this is all it takes, the exclusion was accidental or the result of a misunderstanding, and once I've helped break the ice, the game is on, everyone finds a role, and I can begin extricating myself. Sometimes, however, by putting myself in the middle of things, I learn a little more about why things aren't working out. Sometimes I discover that the child is being excluded for a valid reason. For instance, "She keeps knocking down our buildings." I then turn to the child and restate their objection, "They don't want you to knock down their buildings. If you want to play with them, you can't knock down the buildings. If you want to knock down buildings, we can play that game over there," setting up a couple of concrete options, giving the child a chance to weigh out what is most important to her. Sometimes I'll find that there is already an intense game in process, one that doesn't currently have room, for whatever reason, for another participant. I'll say something like, "We want to play with you," and give them an opportunity to explain why their game is a two person operation, to which I'll reply, "Oh, then we'll play with you later. Come on, let's do something else." We then set up shop nearby, often playing the very same game they're playing. Not always, but often then, the two games easily merge into one. Of course, often I'll see that it is a clear case of exclusion, something done simply as a way to exert power at the expense of another child. This is usually the domain of a group of three or more kids. In this case I might invoke our rule, You Can't Say You Can't Play, reminding the children that this is something to which they've all agreed. If nothing else, it's a way to start a conversation. There are times when I find myself coaching children the way I did Josephine, but at least as often, it's about the role modeling, inserting myself into the play again and again, not commanding the other children but just dropping to my knees and getting busy.